The quarter-finals’ all-South American clash was set to be the most exciting of the round. The hosts have been lacklustre but still managed to advance past a testing Chile side, while Colombia were the last really entertaining side left in the tournament albeit showing some defensive frailties. Luiz Felipe Scolari brought back Paulinho into the side due to Luiz Gustavo’s suspension and Maicon made his first start ahead of Dani Alves. Jose Pekerman changed back to the 4-2-3-1 he had mainly used in the group stage, bringing back Victor Ibarbo for Jackson Martinez and for some reason giving Freddy Guarin a start over Abel Aguilar. The Brazilians’ strategy here was very similar to what we saw against Chile: their defensive line sat deep and this opened up the centre of the pitch. You would expect this to mean they have basically conceded the midfield, but instead it baited Colombia into played at a faster tempo than they usually would so neither team had much control over the flow. Colombia could pick up the ball and drive through the middle, tiring themselves out just as the Chileans had done. The constant need for the full-backs to get up and down and Guarin getting pulled high also meant Brazil were able to isolate the comparatively weak Colombian defence. 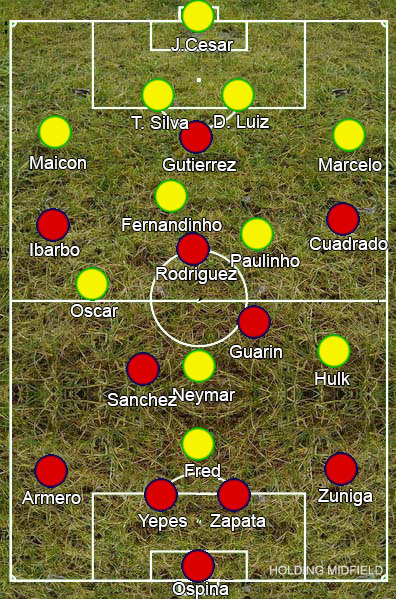 That the Brazilians continued to do it after scoring still suggests it was a fortunate mistake rather than a conscious tactical decision, but Scolari has found a way, although admittedly very risky, to turn the matches against the carefully-crafted units (who are essentially superior teams despite their less prestigious reputations) into wars of attrition by pulling the midfield open. The gameplan’s success was also heavily reliant on the ineptitude of the officials though. James Rodriguez was perhaps the only Colombian to not look flustered by the openness of the game, yet he couldn’t take advantage because the Brazilians were kicking him out of the game. The match featured 54 fouls but just four yellow cards. If the referee had the bottle to do so, Brazil could have easily gone down to ten and then Colombia may have calmed the game down and took control. That he did not allowed Brazil to claim the victory via set-pieces, but turning the game into a running battle meant losing Thiago Silva to suspension and Neymar to injury. Brazil now go on to face the Germans, meaning at least one team can’t add another miserable victory to their spawny runs.